The colossus under the subnotebooks . This machine will allow you to work 5 hours straight, to the point where you have smoke coming out of your ears. With this 35Watt Core i3 System, Acer manages to extract a level of battery performance which most low voltage subnotebooks can only dream of. Read on to find out how it was done. 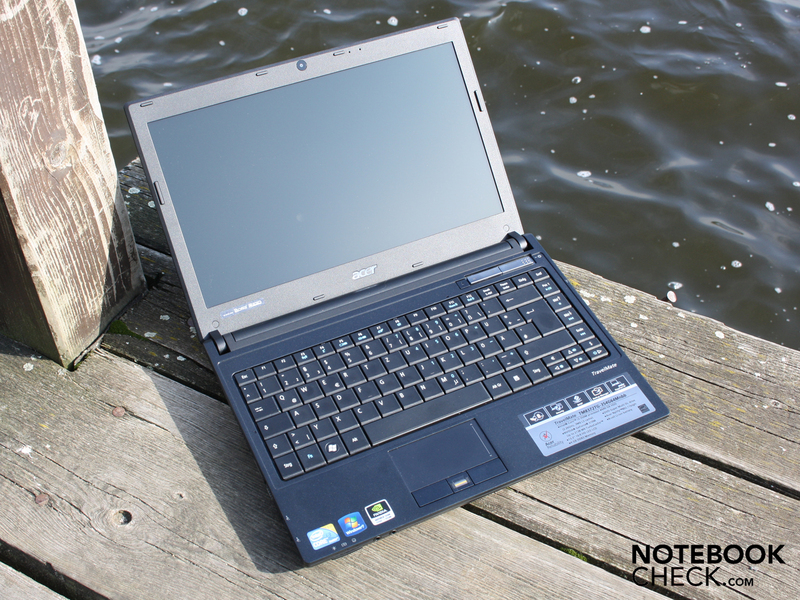 Acer TravelMate TimelineX 8372TG-354G64N (LX.TX302.002) Good performance combined with a long battery life? Small, high performance subnotebooks have become cheaper and more powerful over the past few years. Consumers can get models up to Core i5-520UM (low voltage), which brings turbo boost to a consumer level. For business folk who have slightly deeper pockets, Intel has the more powerful Core i7-640LM (low voltage) in store. So does this mean the market is covered? Not quite. 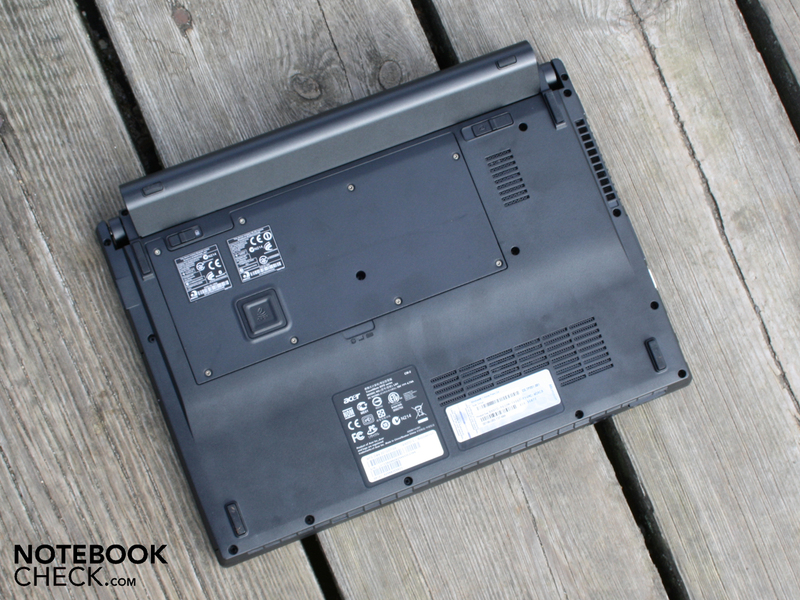 Not everyone can afford an i7-subnotebook and on the other hand, the performance of the i5-520UM is limited. So why not take a standard laptop processor instead? A Core i3-350M (2x 2.26GHz), would be best as it is cheap to buy and faster than the i5-520UM. These cheap CPU's can be found (for example), in the 15.6", MSI CR620 (from 470 Euro). 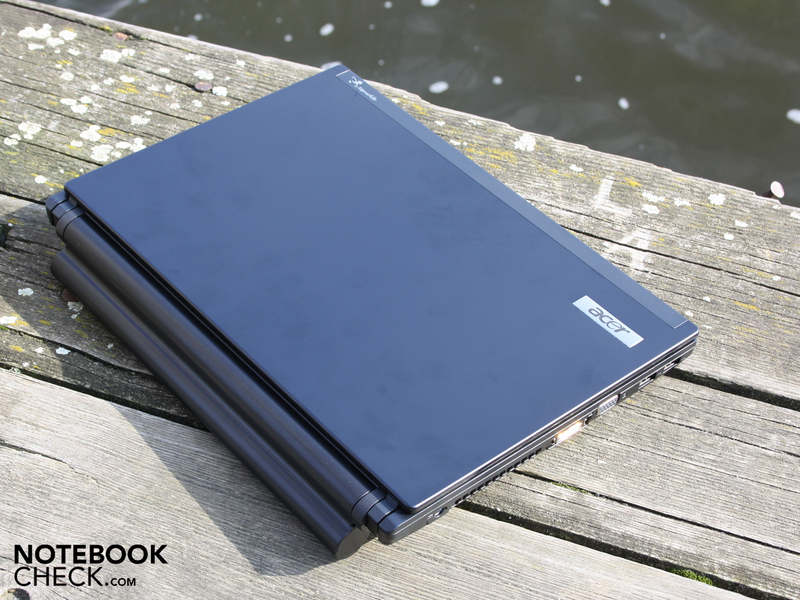 Read on to find out how Acer managed to squeeze desktop performance of a compact 13.3" subnotbook with a cheap consumer level processor and a GeForce 310M hybrid graphics card, while still being able to impress with the long battery life provided by the 8 cell battery which is provided. One thing is for sure however, this piece of technology won't be winning any beauty competitions any time soon. Acer's test unit looks pretty chunky and weighs in at a hefty 2.11 kilograms. This is very heavy by subnotebook standards. 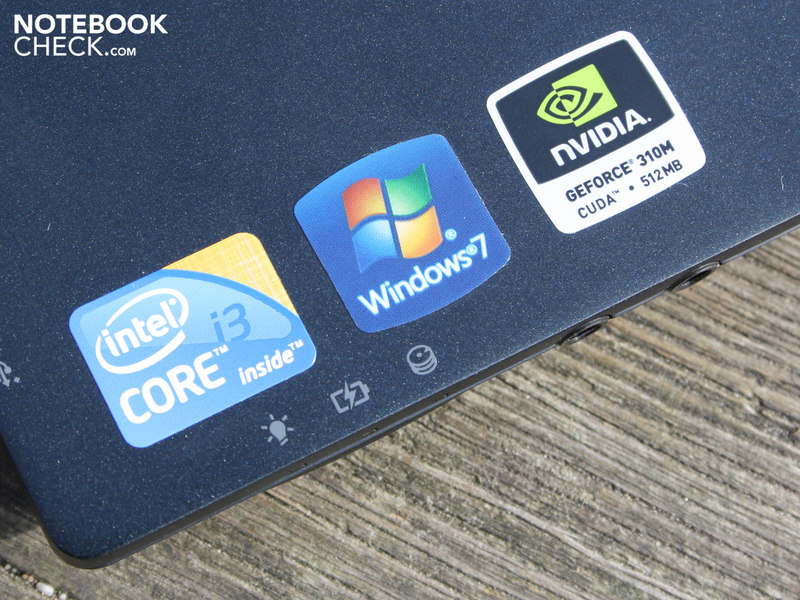 Other 13" laptops in this category typically weigh less than 2 kilograms. The reason for the weight gain can be found with the 8 cell battery, which by itself weighs 425 grams. The casing is suitable for mobile applications as it is very warp resistant. "As strong as steel" would only be one way of describing what we experienced. No matter how hard we tried to bend, flex or pull the base unit, it refused to give an inch. 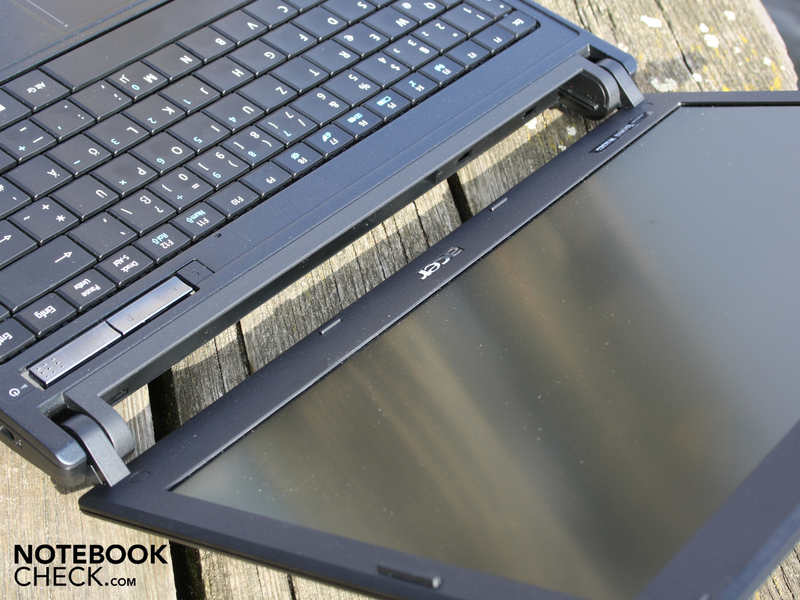 The Acer engineers definitely did their homework while they were working on this 13" colossus. The palm rest impresses with its level of stiffness and refuses to be warped under pressure. All the surfaces, which includes the keyboard, base plate and lid are very solid and don't flex at all. Not even under extreme force. Even the level of stiffness in the middle of the aluminum lid (pressing down), managed to impress us. Consider its thin construction, the lid is very warp resistant. Grabbing it at the corners, we only managed to bend it a little bit. The hinges are mounted firmly to the base plate. The display is held taught. The wobbling screen one may be accustomed to during car and train journeys won't be found here. The protruding 8 cell battery sticks out like a sore thumb. 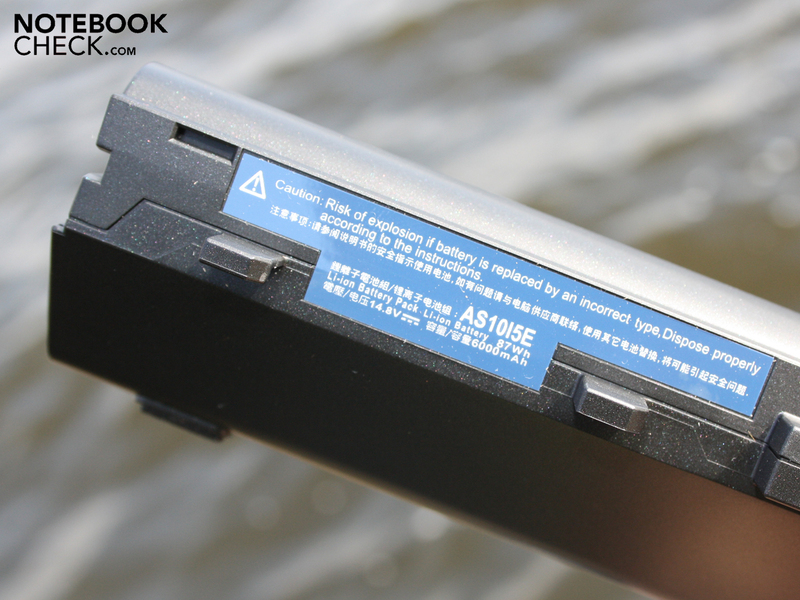 Acer managed to turn a lemon into lemonade however by adding rubber feet to the underside of the battery. 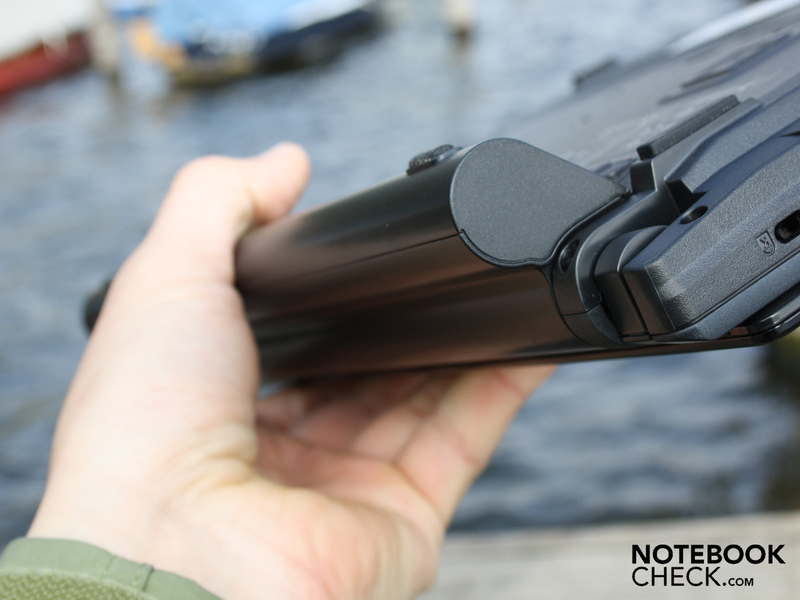 This raises the rear of the subnotebook giving it a more ergonomic feel while being used at a table, while also providing good grip while being carried. The battery itself does move slightly when locked into place, but there is no risk of it coming lose at any point. The surface of the workspace is ideal for heavy use. 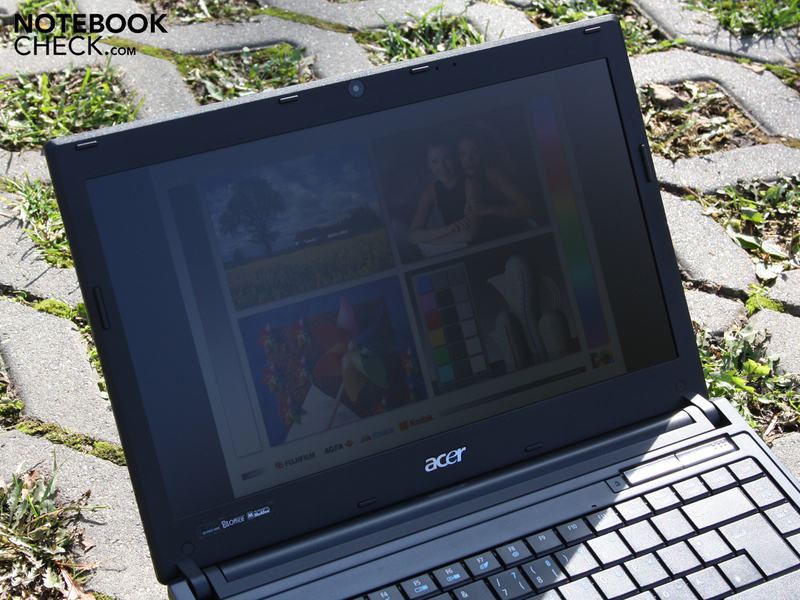 Acer chose to avoid the use of glossy materials throughout. The matt, silver power and WLAN buttons try to provide a little contrast to an otherwise monotone exterior, but don't really succeed. Acer went for minimalism when deciding on interfaces. Compared to business laptops such as the HP ProBook and Elitebook, which manage to cram in a large variety of interfaces into even the smallest spaces, the TimelineX 8372TG offers next to nothing. The reason for this might be, that there is a docking station which can provide all the interfaces one could ever need while working in an office environment. More about that in the next section. This 13.3" laptop has a DVD drive, which is another reason why there is not much room left for other interfaces. Most of the interfaces are on the left side. 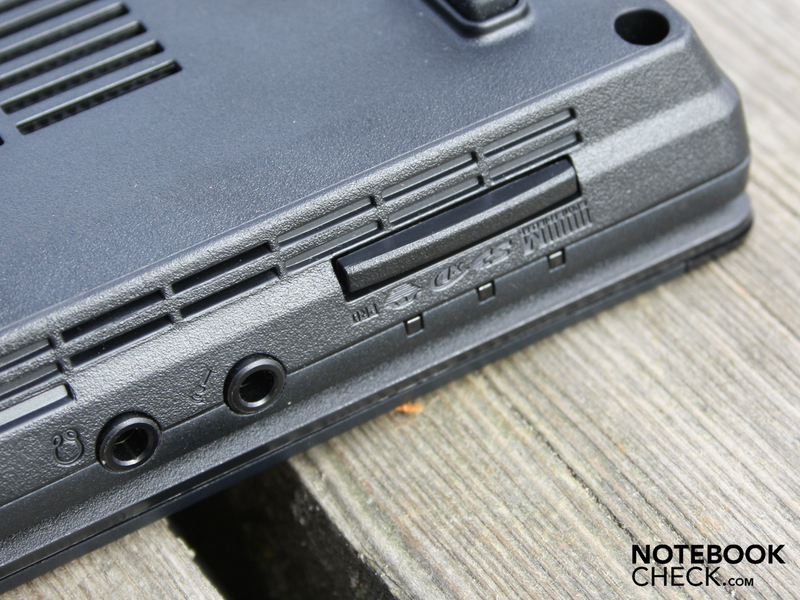 The rear is occupied by the battery. The positioning of the interfaces seems logical: The VGA is located next to the Easyport IV connector on the left hand side. This prevents thick cables from getting in the way of a "right handed" mouse. For left handed users the VGA cable is most definitely in the way however (not when used in combination with the EasyPort docking solution). The interfaces are located quite far forward. 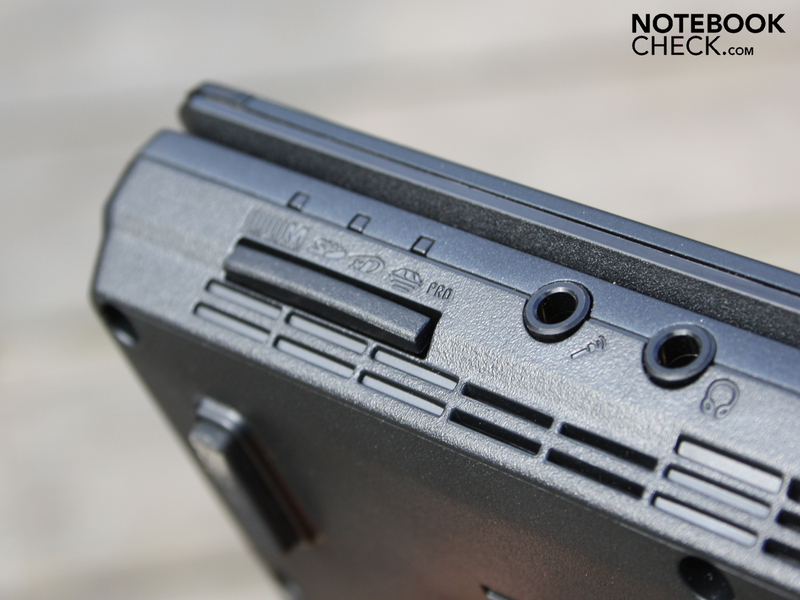 A card reader (SD, MMC, MS/Pro, xD), as well as audio ports can be found at the front. Three USB 2.0 ports, a VGA and an Ethernet interface is all you will get at this point. 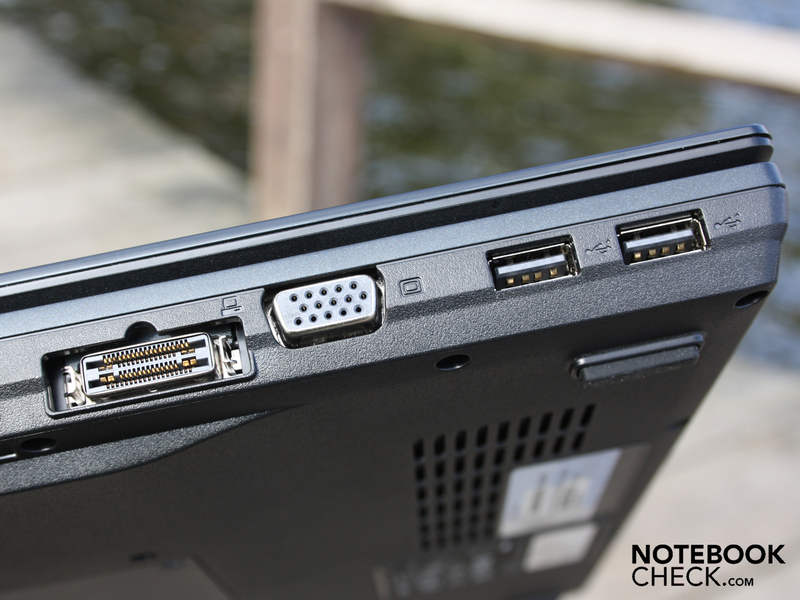 E-SATA, display port, HDMI or FireWire, which you may find on units such as HP's 12" EliteBook are luxury items which this Acer TravelMate simply can not offer. The Broadcom 802.11n adapter supports the fastest WLAN, Draft-N standard. 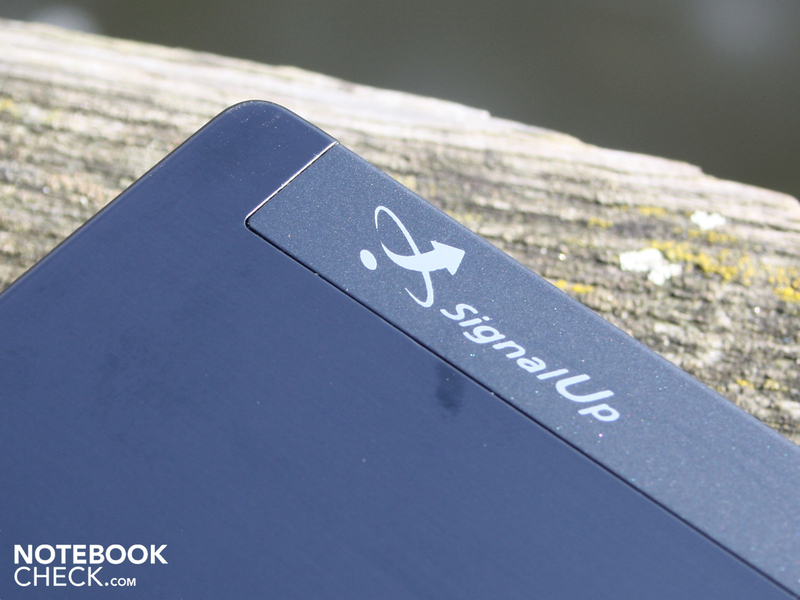 Acer's SignalUp wireless technology is meant to provide an enhanced signal as well. A Bluetooth module (2.1 + EDR) has been included as well. Those who want to benefit from the gigabit switch in the office will be able to do so with Broadcom's NetXtreme gigabit Ethernet card. The network card is Wake-on-LAN ready(remote support). 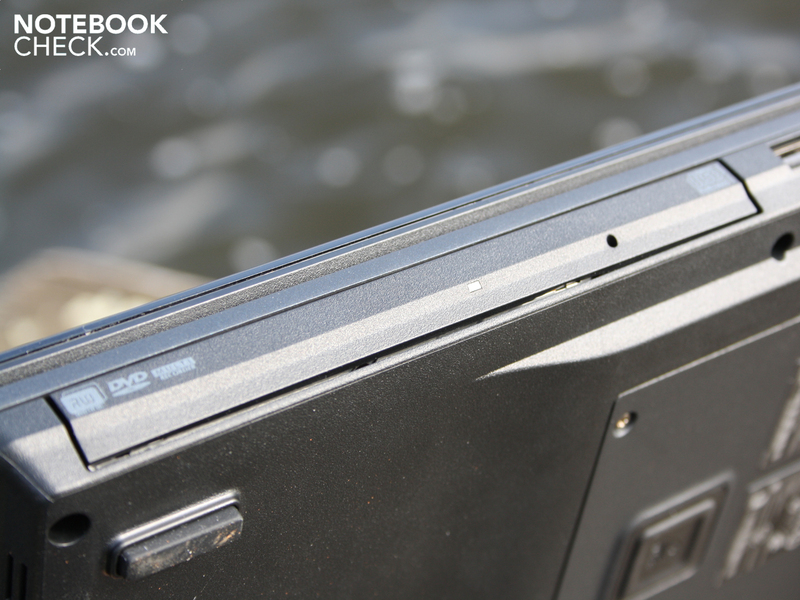 The hard drive is mounted in a rubber surround (Acer DASP - Disk Anti-Shock Protection). The finger print reader cannot only be used for the Windows login but also for the Pre-Boot Authentication (PBA). The BIOS also provides the option to setup user, supervisors and hard drive passwords. A TPM Module (Trusted Module Platform) is not included in the 8372TG. 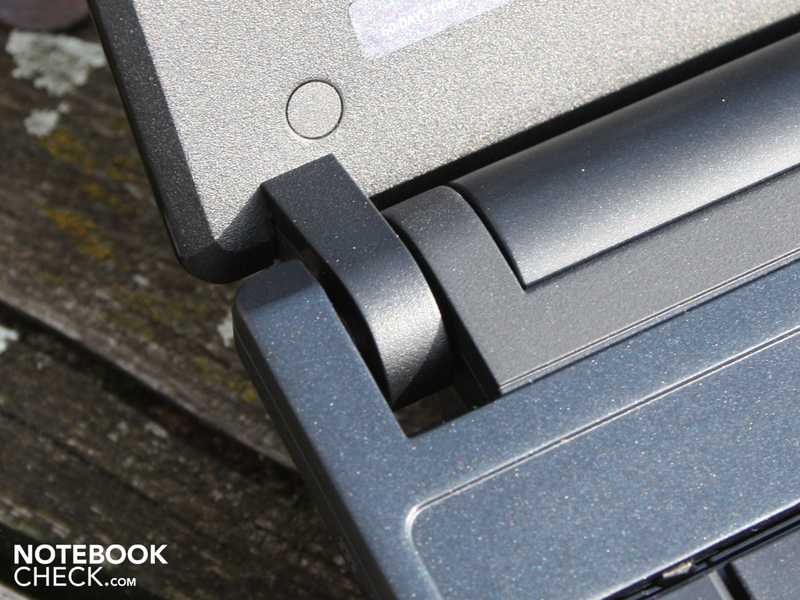 The 8372TG is equipped with a Docking-Port for the Acer EasyPort IV interface (roughly 100 Euro). This unit replicates the existing ports as well as providing additional ones such as HDMI and a line-in, while reducing the amount of wires on the table surface. This way users no longer have to connect their peripheral units to the 8372TG one piece at a time. Often it would not be possible to work without the additional interfaces that are provided. The EasyPort IV provides 4 USB-, RJ-45- (LAN), VGA- (D-Sub), DVI (24-pole) and audio ports (line-out, line-in, microphone). 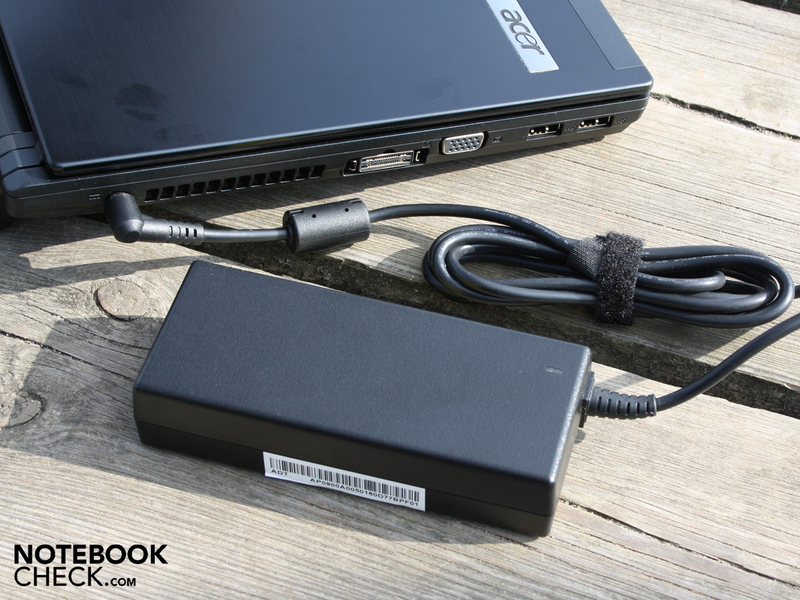 The laptop will also be charged through the docking station which is supplied with its own 90W power supply. The Ethernet port has a "passthrough". 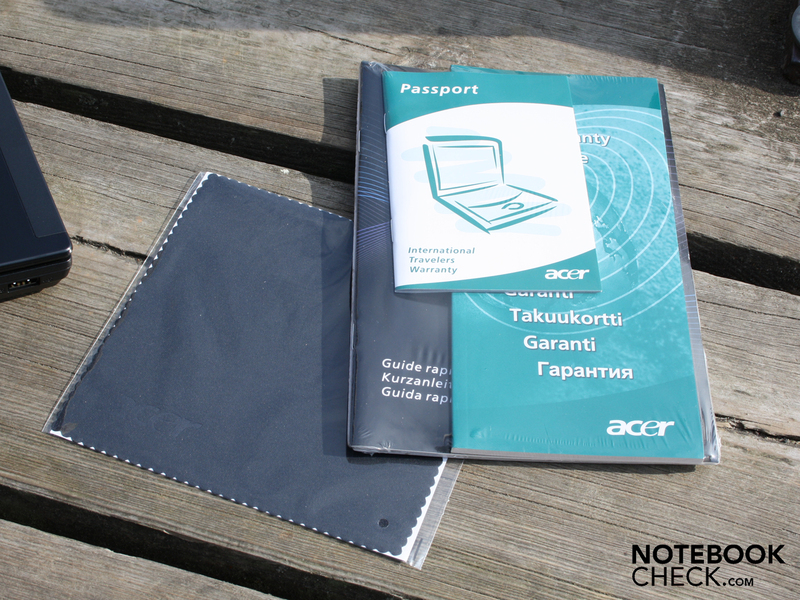 Acer offers a 2 year warranty for the TravelMates which includes a 1 year international travelers warranty. The 2 years consist of a 1 year product warranty and 1 year advantage warranty. The Keyboard is solid and gives the typist a hard yet quite noticeable keystroke, even if it is very short (approx. 2 millimeters). At first glance, the surface of the keys looks completely level but looking closer one can see there is a slight impression in each key. It is so small however, that it does not help ones fingers to feel their way around the keyboard. 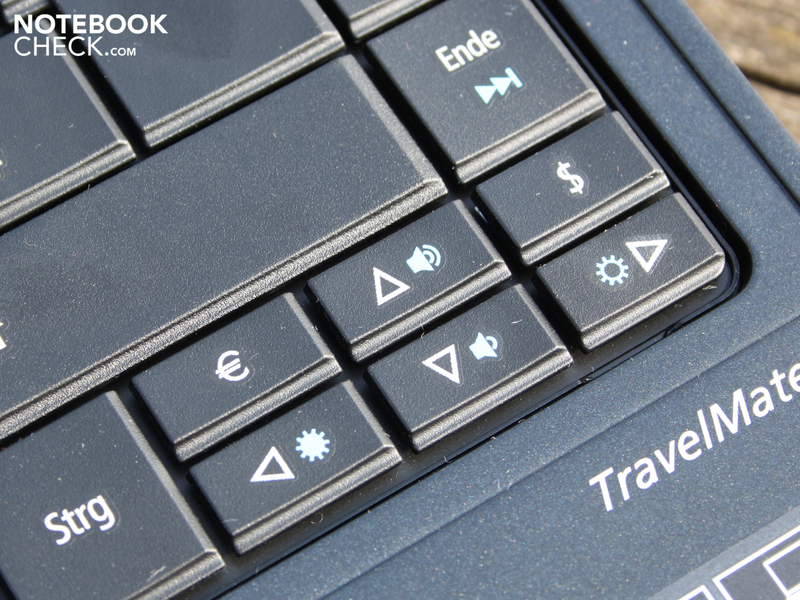 The arrow keys have been squeezed into the right corner of the keyboard and have to share this space with the Euro and Dollar symbols. The enter and shift keys on the other hand are well proportioned. 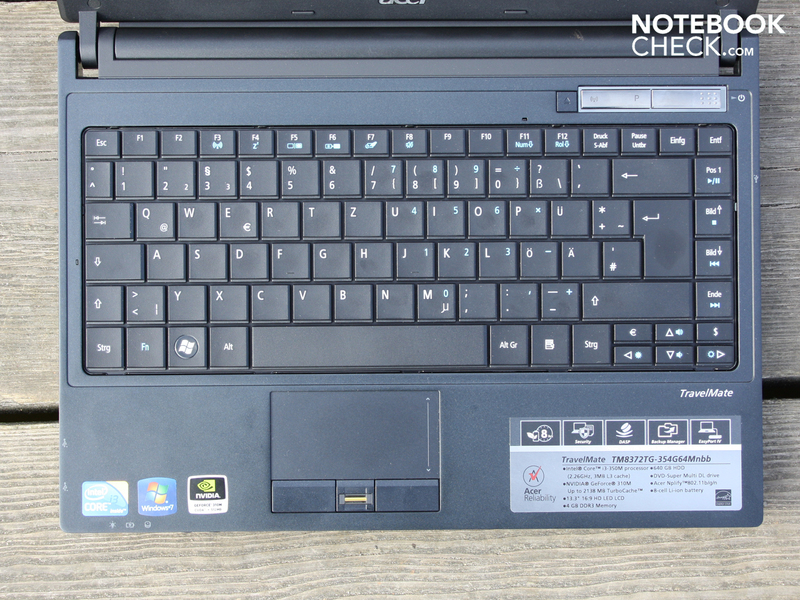 Because of its small size, a number pad is out of the question, but users can use the Fn key to use the "number pad" which can be found in the regular keyboard layout. This can be identified through the blue numbers and calculation symbols. 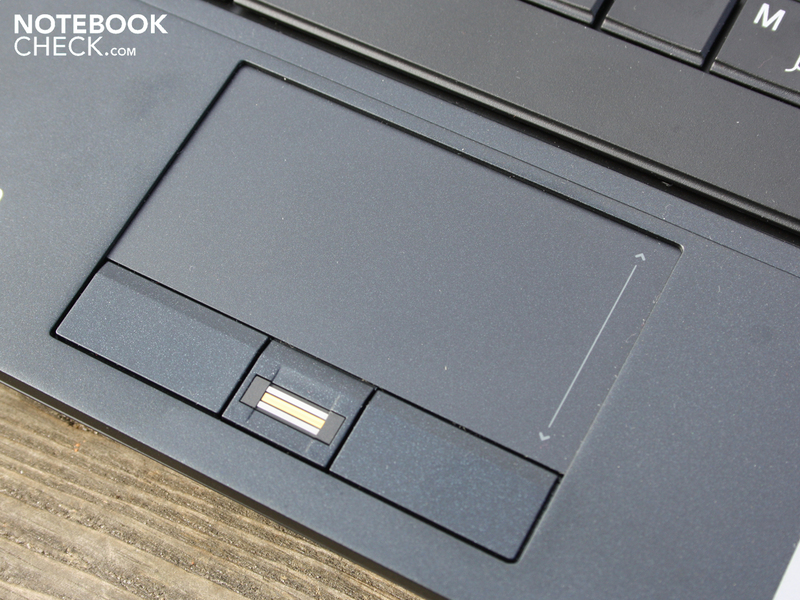 The touchpad is made up of a Synaptics-Touch-Pad V7.4 with diameter of 8.5 centimeters. The surface is reactive right up to the outer edges. The pad has both vertical and horizontal scroll surfaces (inactive as default). 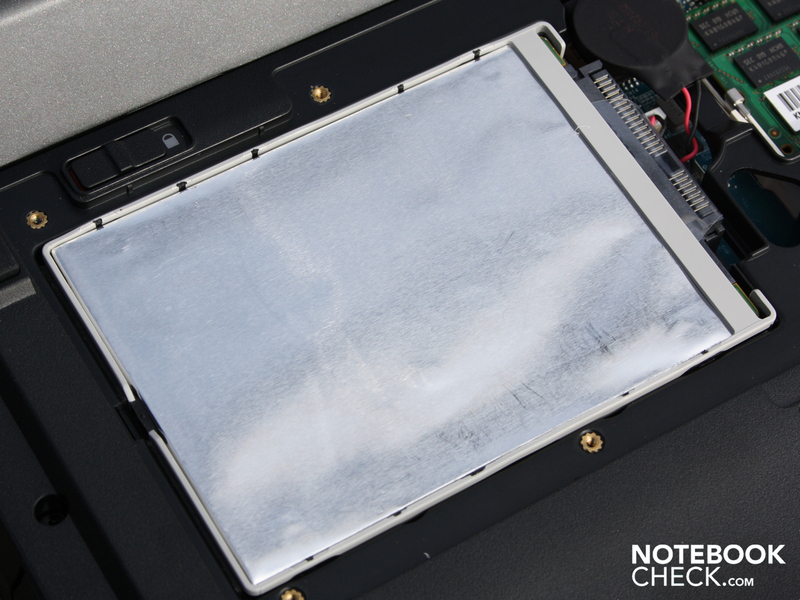 In addition, the multitouch pad will perform all the "multi finger" inputs you are familiar with. We were not as pleased with the short stroke on the two "mouse" buttons. 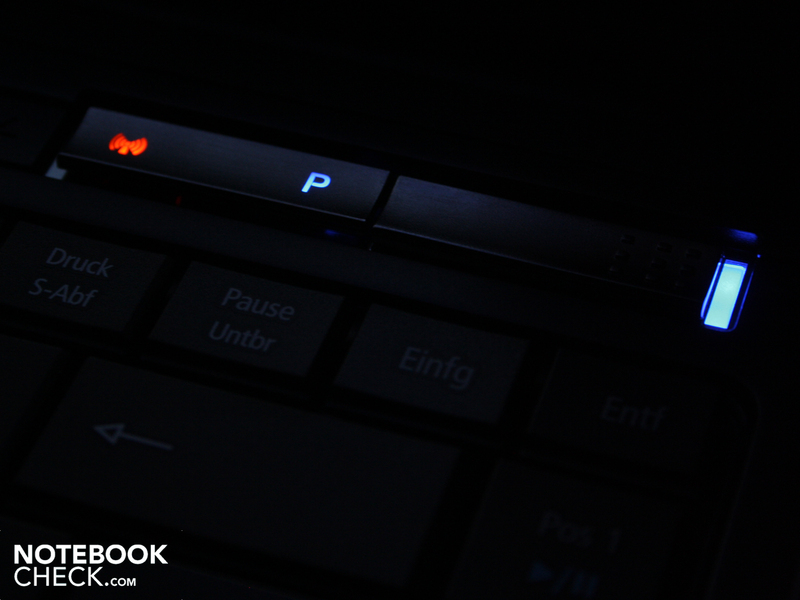 The pressure point is noticeable however, and the clicking noise is nice and subtle. Despite the matt surface, the AUO panel (type B133XW03 V3), doesn't really impress. The 16:9 screen provides a resolution of 1.366 x 768 pixels which is pretty average for this type of screen. Unfortunately, the weak contrast of 166:1 is pretty standard as well. The colors aren't very radiant and the black colors have a grayish tinge to them. The matt finish is however not the reason for the low contrast levels. A glare type would provide more radiant colors, while not affecting the black (1.13 cd/m²). 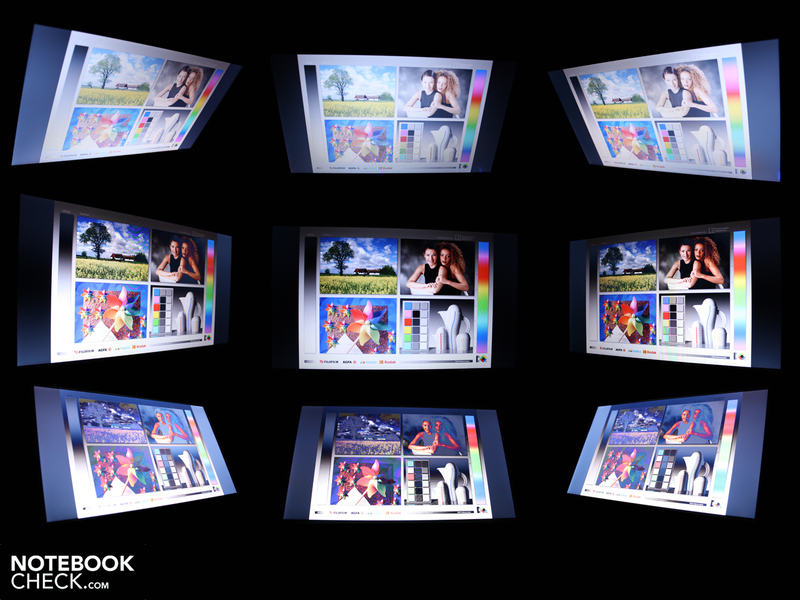 The small color palette is in line with most laptop displays which are currently on the market and only provides a small section of the Adobe RGB or sRGB range. What this AUO panel is really missing, is a good level of brightness. We measured an average of 182 cd/m². The highest level registered by the Mavo Monitor was an value of 189 cd/m² in the middle of the screen. Considering that this unit may be used outdoors on a regular basis, a value exceeding 230 cd/m² would have been preferable. Never the less, the brightness is very evenly distributed across the screen: 90%. Is a display with a matt finish just the right thing for working outdoors? As a matter of fact it is one of the most important things one needs to ensure, that working outdoors, remains a relaxing yet productive experience. No matter which we turned or tilted the 8372TG we only saw very weak reflections. The substandard brightness of 182 cd/m² is, however, simply too low. These pictures show the display during a slightly cloudy day. The illumination is sufficient when looking straight on with indirect sunlight. Looking from the side sees a significantly reduced level of brightness however. If the intensity of the sunlight were to increase, the screen would be too dark to be able to work comfortably. Just like the owners of glare-type screens, it looks like outdoor fans of this unit will have to go and find themselves a shaded corner to sit in. The horizontal viewing angles are quite good. Text is recognizable up to 50 degress away from the ideal, head on viewing angle. The colors start to invert a bit sooner at around 40 degrees. Looking downwards (vertically), one can easily read written text up to an angle of 30 degrees. The brightness on the other hand starts to drop off rapidly once one goes past a 10 degree angle. Text is still legible, but there is a significant amount of color inversion. The power plant which Acer has chosen is one of the smallest Arrandale processors, the i3-350M. At around 32 nm, it is currently being produced with the most modern of manufacturing techniques. It has 3MB L2 Cache (Intel Smart Cache), and is clocked at 2.26 GHz. The difference to the Core i5/i7: Core i3 does not have Turbo-Boost. This function allows a dynamic over-clocking of the cores depending on the demand and application at hand. Hyper-Threading (HT), is included however. This ensures, that each physical core has a virtual core at its side. Therefore, the four core i7 can process using 8, and the i5 and i3 with 4 threads respectively. The i3-350M is support by 4.096 MB of DDR3 SDRAM. This is spread over 2 modules, which has now come to be the standard on Windows 7 operating systems(our test unit had 64 Bit). It comes with two graphics solutions. The hybrid graphics consist of a dedicated Nvidia 310M as well as an integrated Intel HD. It is not Nvidia's Optimus that switches between GPU's, we are looking at a traditional multiplex system here. The drawback of this system is that there can be delays during a manual change-over, as well as flickering black screens. On top of this, no program or application can be using one of the cards during a switch. Nvidias Optimus technology does not have this problem as it always uses the frame buffer of the Intel HD and automatically selects the correct GPU for any given circumstance. The aim of hybrid graphics is to reduce the power consumption and lengthen battery life. So how fast does the Core i3-350M calculate compared to real, and expensive low voltage processors? In order to analyze this we used the Cinebench R10 Single benchmark test (32bit). When using only one of the four threads the system manages to score 2.459 points. 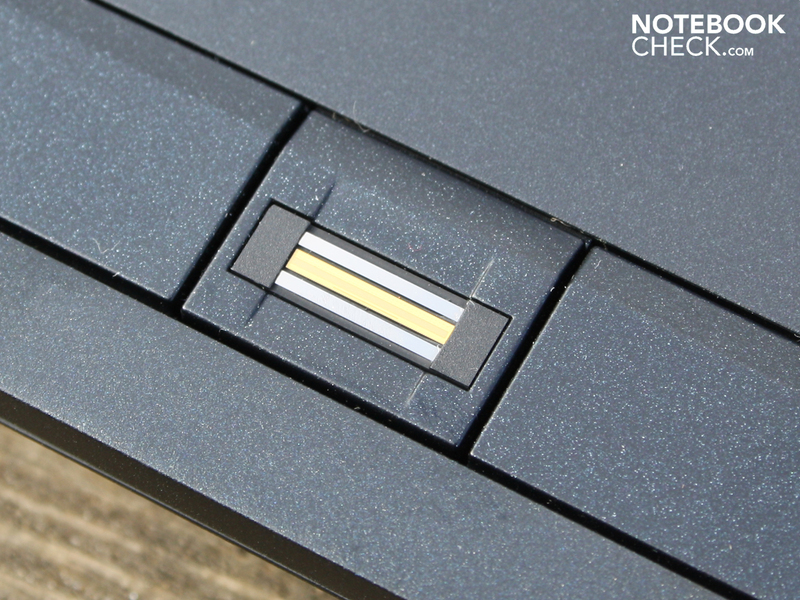 Subnotebooks with a i7-640LM (HP EliteBook 2540p; Lenovo Thinkpad X201s 5143-4JG), can achieve 2.980 or even 3.127 points. The 350M therefore gives way to the greater performance of the up-market i7-640LM. The consumer level, low voltage i5-520UM (with turbo boost), only manages 1.957 points, or 2.549 points with over-clocking (Asus PL30JT-RO030X, Asus UL30JT-RX014V-4). So what is the performance like with multiple cores? We tested this using the Cinebench R10 Multi-CPU Test (32bit). Our test unit managed to award itself with 5.723 points. This means that the i3-350M is significantly better than the i5-520UM (3.368 points, Acer Aspire 1830T). When over-clocked (Asus PL30JT, Asus UL30JT), the 520UM can achieve 5.225 points as well however. The 350M can not compete with the i7-640LM however, which can achieve a higher score using just one core (6.043 or 5.869 points). 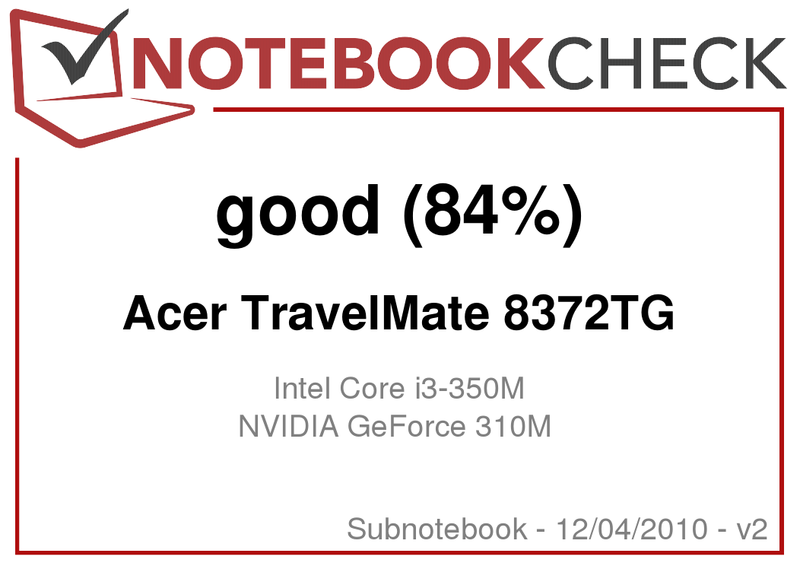 In the system tests, the standard core Core i3-CPU in the Travelmate 8372TG seems to provide greater performance than the consumer low voltage i5-520UM. Will this hold true for the applications as well? The PCMark Vantage gave it 5.190 points. This score is higher than that achieved by the over-clocked i5-520UM (Asus PL30JT-RO030X, 4.536 points). 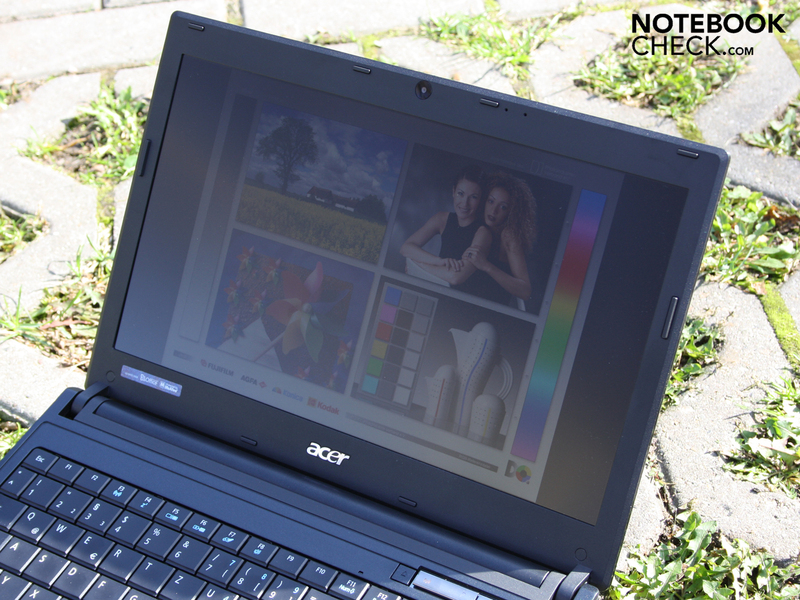 When not over-clocked the 520UM only achieves 3.950 points (Acer Aspire 1830T-52U4G32n). Even the fastest Core 2 Duo SP9400 systems (Dell Latitude E4300, 7.200 rpm HDD), from the previous low voltage generations are beaten with only 3.732 points. Strong low voltage units such as the i7-640LM we mentioned earlier can provide more get up and go. This includes the Lenovo Thinkpad X201s 5143-4JG which has 5.869 and the HP EliteBook 2540p (12"), with 6.043 points respectively. The Travelmate 8372TG provides a level of performance which is typical for a Core i3-System. 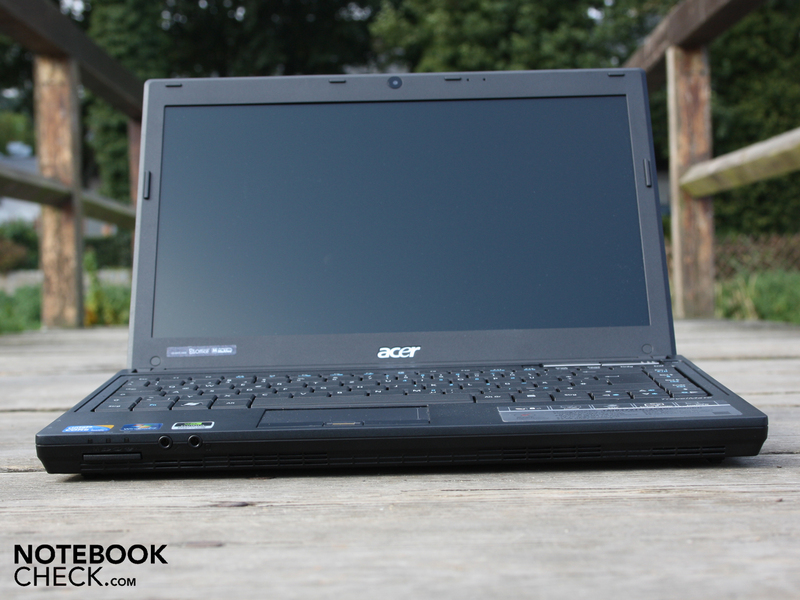 Acer did not put any performance restrictions in place in order to increase battery life. 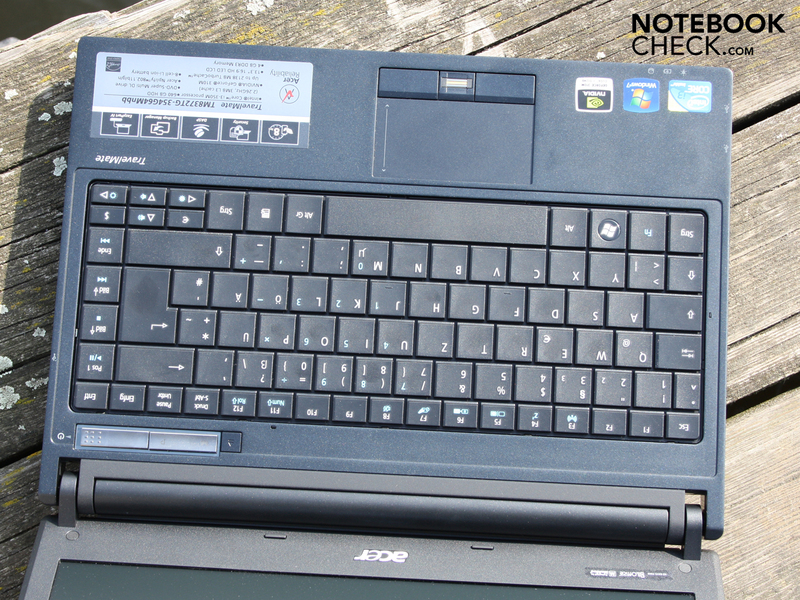 I3 units, such as the Asus K72JK-TY001V (HD 5145), achieved similar PCMark scores 5.296 PCMarks. We should note however, that the score of the PCMark Vantage is also dependent on the HDD, GPU and memory. The Western Digital hard drive (type WD6400BEVT-22A0RT0), with a massive gross capacity of 640 GB spins around at a familiar 5400 rpm. HDTune measured an average value of 67.7 megabytes per second during sequential reading. This value is pretty standard amongst comparable 2.5" hard drives. The Nvidia GeForce 310M is classified by NVidia as an entry level graphics card which has access to 512 MB of DDR3 memory. The memory is clocked at 790 MHz, while the core is at 625 MHz. The GPU is not really made with games in mind. It does however support the processor with HD decoding (H.264, MPEG-2, MPEG-4 etc.) as well as video coding (CUDA, DirectX Compute und OpenCL). The 310M supports DirectX-10.1 but not PhysX. The latter could not be used in this application anyway due to the cards level of performance. The 3DMark06 gave it a mere 3.245 points. We are familiar with negative results concerning the game play from plenty of other, comparable test units we have had which is why we decided not to do a gaming test at this point. All of the information you will need concerning the level of gaming that can be achieved can be found in our article about the Nvidia GeForce 310M and in our gaming list. The noise levels are quite remarkable and don't leave much to wish for. At a constant 30 dB(A), this 13.3" remains quite when at idle. Even when one gets the impression that the fan has turned itself off, it actually hasn't. At its lowest setting, the fan runs so quietly that our measuring equipment could not detect any noticeable peaks. Those who use Word and read E-Mails wont even notice the fan is running as this system doesn't go beyond 34.5 dB(A) when confronted with small and spontaneous increases in load. When the i3-Prozessor and Nvidia 310M are called upon at the same time (stress test), the noise does become somewhat noticeable at 40.5 dB(A). The fan on our test unit had an interesting characteristic after being pushed under full load for some time: After a heavy load, the fan would remain at 42.2 dB(A) for about 20 seconds and then dive back down to a substantially lower 34.5 dB(A). One can't complain about the heat which is generated either. At idle and during office use (which is the scenario that suits the Travelmate best), there are only a few parts that actually get warm (well under 30 degrees). The underside only gets up to 30 degrees in certain places as well. Even during the stress test, we only saw 45 (top) and 40 degrees (underneath). The average values remain well under these however as parts of the base unit were still quite cool. The stress test (FurMark & Prime95) did not managed to get the Intel Core i3-350M over 85 degrees whereas the GPU attained 85 degrees during the same period. (±) The maximum temperature on the upper side is 44.8 °C / 113 F, compared to the average of 35.8 °C / 96 F, ranging from 22 to 57 °C for the class Subnotebook. (-) The average temperature of the palmrest area of similar devices was 28.6 °C / 83.5 F (-7.5 °C / -13.5 F). 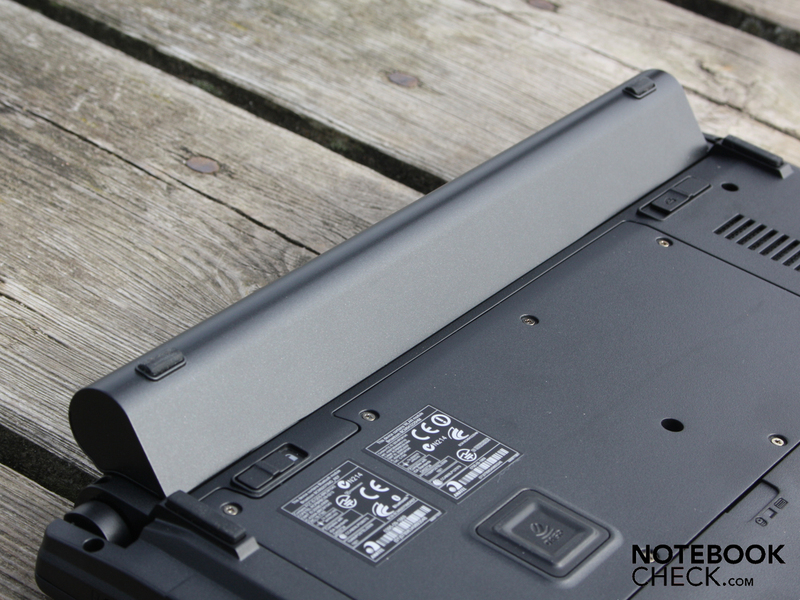 The stereo loudspeakers of the 13.3" laptop can be found at the front behind the air intakes. They deliver a rather high pitched sound which is not all that pleasing. There is not base to speak of, and the settings in the control panel don't have any positive effect. (e.g. virtual surround). The volume they produce however is impressive considering their size. There was no noticeable distortion when the volume was turned to full. External loudspeakers and headphones benefit from a high output level which also turned out to be free of background noise. One area where the Acer TravelMate 8372TG really shines is the battery life. As it happens, the i3-350M is actually quite power hungry with its nominal usage of 35 Watts (TDP). 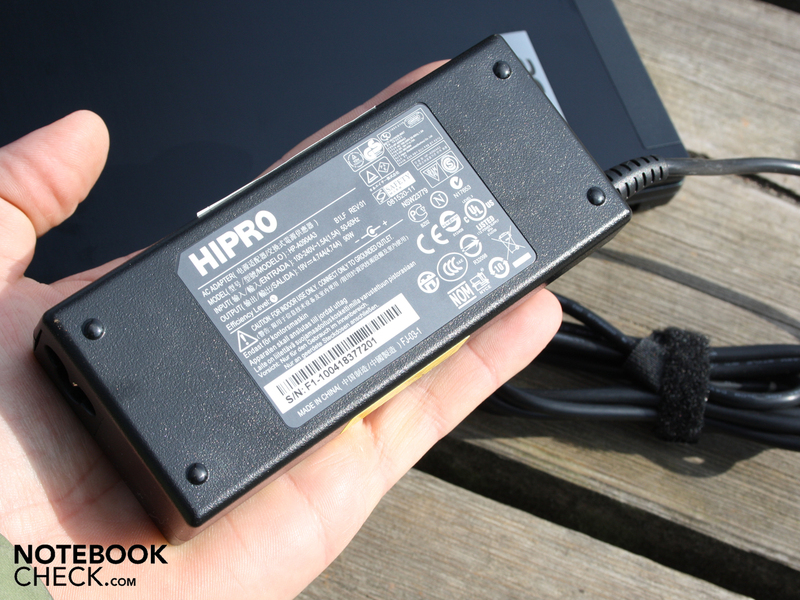 Acer chose to compensate for this by installing a 87 Wh battery (6.000 mAh) and did so with notable success. The only things that suffer are the weight and the appearance due to the protruding battery. It took 5:22 hours (322 minutes) of web surfing until the Travelmate 8372TG needed to be charged up again. In comparison, the Asus PL30JT-RO030X (i5-520UM, 13.3"), with its low voltage CPU lasts for about 378 minutes (84 Wh). During the test, the LED panel was set to an intermediate level of brightness, which is roughly 100 cd/m². The DVD movie just kept on going and it wasn't until the 3rd showing that the Hobbits finally had to leave the stage. 6:45 hours (405 minutes). A full recharge takes a hefty 3:56 hours. This is a very long time but it is quite acceptable for a battery of this size. The BatteryEater Readers Test, lasted a full 7:34 at idle (454 minutes). This is generally not applicable in the real world however as the WLAN was switched off, the TFT was on its lowest setting and the processor had gone to sleep (idle), through a complete lack of activity. The opposite could be seen when subjected to the BatteryEater Classic Mode. Here, the lights went out after 2:56 hours of running OpenGL calculations. Registering between 11.6 and 14.9 Watt, the power consumption of this 13.3" laptop is not the lowest amongst the low voltage processors (<10 Watt idle depending on brightness and active wireless interfaces). It is still impressive however. A really conservative consumer of power such as the Asus PL30JT-RO030X (520UM) can shine in this segment, using 9.5 Watt during idle and 55.8 Watt under full load. When under maximum load (e.g. stress test), the Multimeter registered a maximum usage of 63.3 Watt. A realistic level of consumption would be around 15 to 20 Watt for office applications. 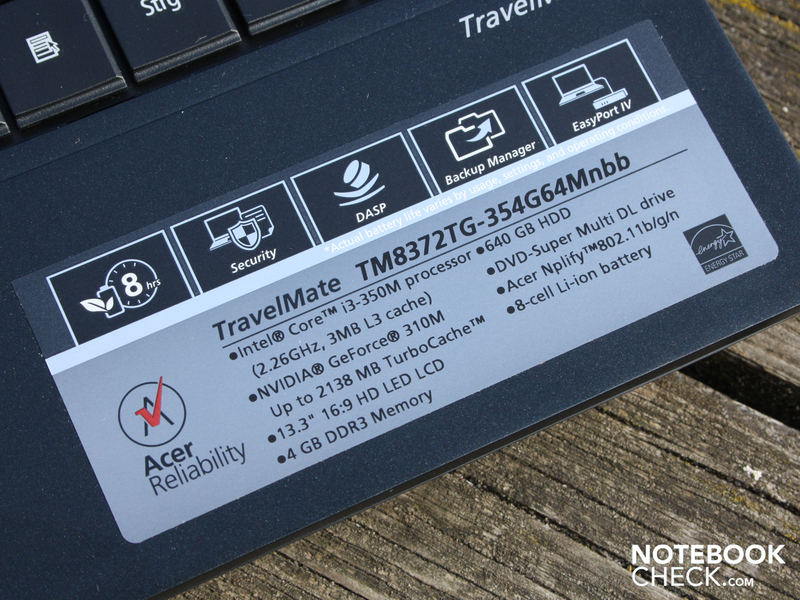 The catch phrase of the Acer TravelMate TimelineX 8372TG-354G64N could be: Long battery life for a competitive price and good performance. Generally, the market would not pay almost 850 Euro for a Core i3-350M system, but it will if it is 13.3" with a dedicated, switchable graphics card. Those who are looking for the performance of a TimelineX 8372TG with a proper low voltage processor (with same battery life), will have to invest at least 1.500 Euro for a Core i7 640LM (HP EliteBook 2540p). The long run time of five to seven hours (WLAN surfing /DVD movie), is not the only advantage this 13.3" laptop has to offer. The aluminum/plastic casing (2.11 kilograms), is incredibly strong. The matt surfaces are ideally suited for professional office use. In addition there is also the exemplary ergonomics, the small amount of heat that is produced, and the fan which is very quiet. Business users will appreciate the docking station which connects to the Easy Port IV. The main weakness that we noticed, is a rather important one, and concerns the input. 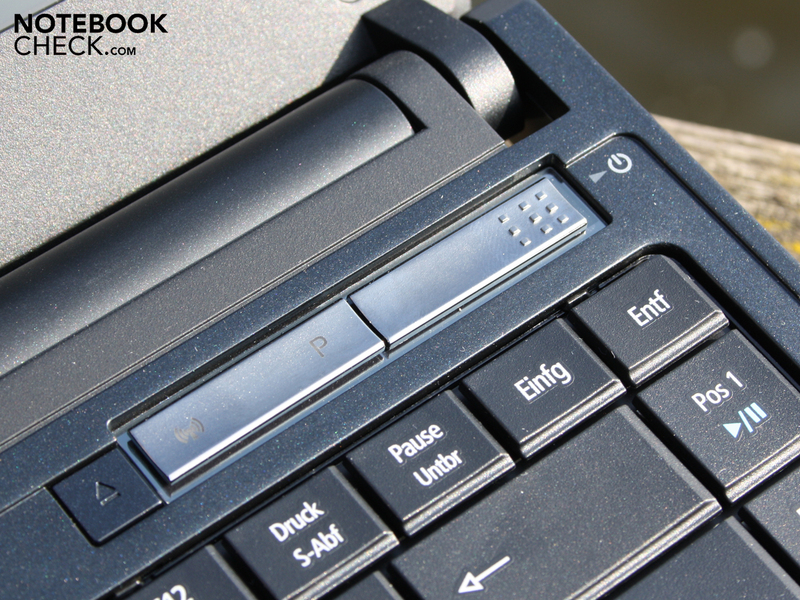 The keys of the keyboard and touchpad have a very short stroke resulting in a lack of feedback to the user. The interfaces are limited, and this can also not be significantly improved upon by the docking station. There is neither an eSATA, nor ExpressCard or HDMI. There is one model available with UMTS (3G) for approx. 960 Euro (8372T-5454G32N). At the end of the day, the matt HD ready display didn't impress either. The brightness is average at best und delivers a level of contrast which is below that. Those who are looking for an even longer battery life, and are willing to sacrifice performance, should take a look at the Asus PL30JT-RO030X. With its Intel Core i5-520UM it offers all the positive aspects of the new Core i5 generation (integrated Intel HD, Turbo Boost, Hyper Threading). Acer TravelMate TimelineX 8372TG-354G64N (LX.TX302.002): Plain but very solid workmanship and great mobility despite the standard Core-i3. 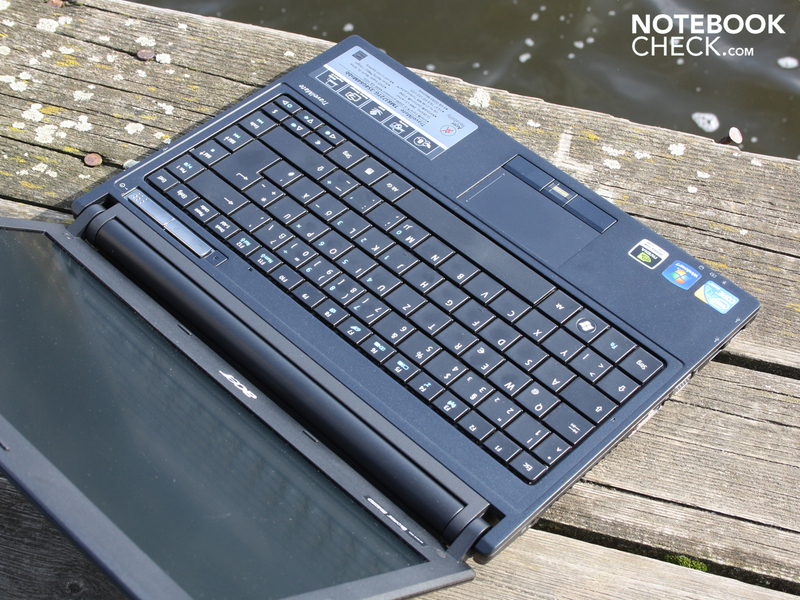 Those who are constantly on the move want a small, handy 13.3" laptop with a long battery life. we find the massive 8 cell battery. 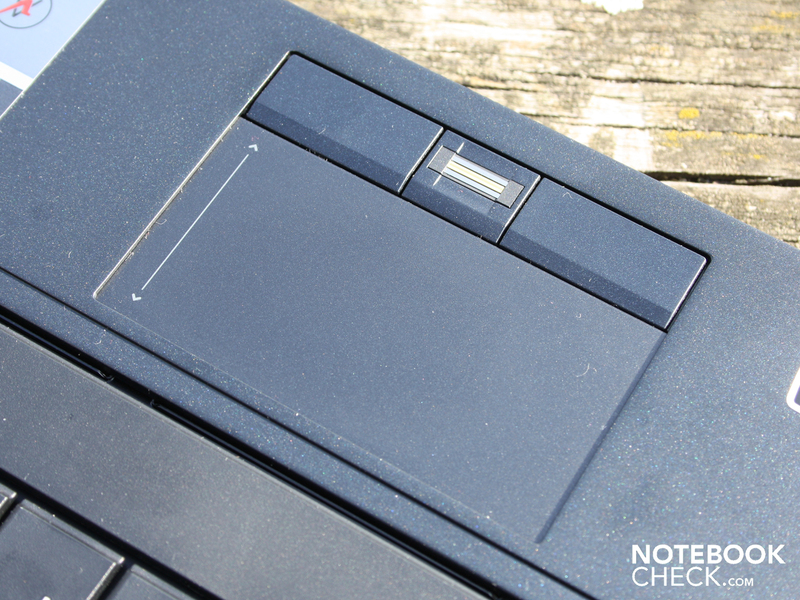 It has rubber feet which raise the back end of the laptop. The battery can be disconnected during stationary operations. but doesn't intrude too much into the workspace. 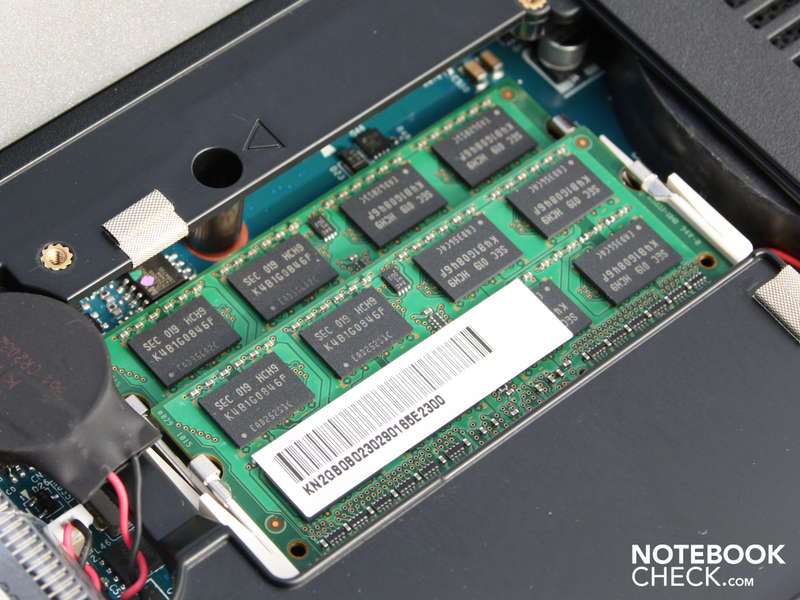 The two RAM modules can be replaced. This sign indicates that the HDD is well protected. The 640GB Western Digital HDD can be found in a rubber casing. 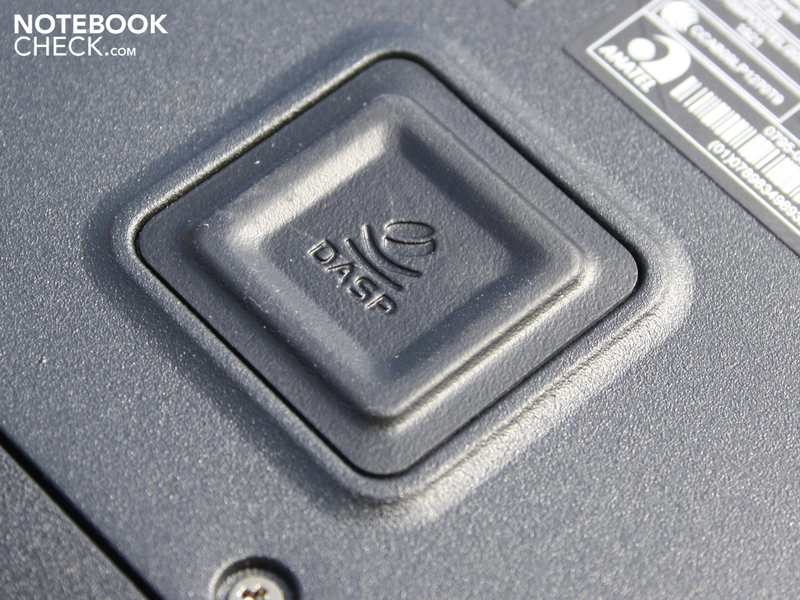 Acer calls it the Disk Anti-Shock Protection (DASP). The power supply seems quite large in comparison. Even the weight is rather high (389 grams). The limited travel of the keys confronts us where ever we go. The input surfaces do not meet high business standards. 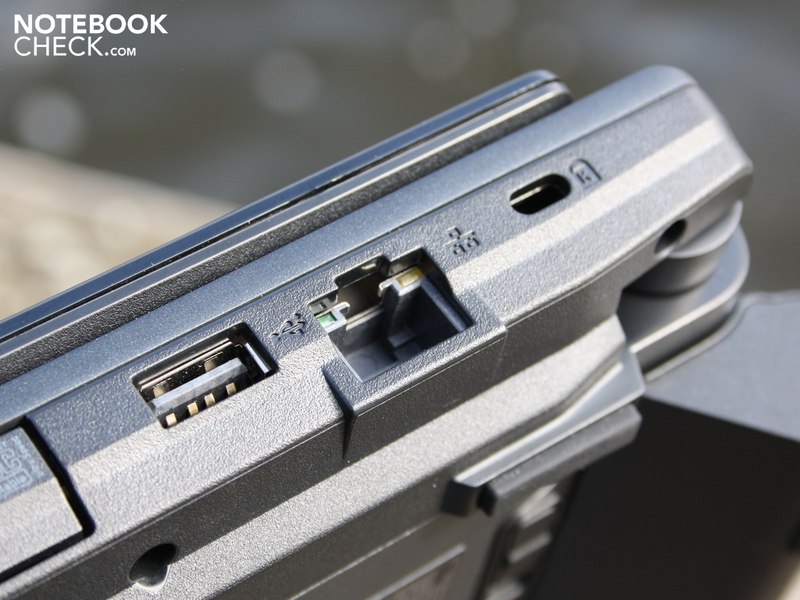 Instead there is an Easyport IV connector with a docking station. 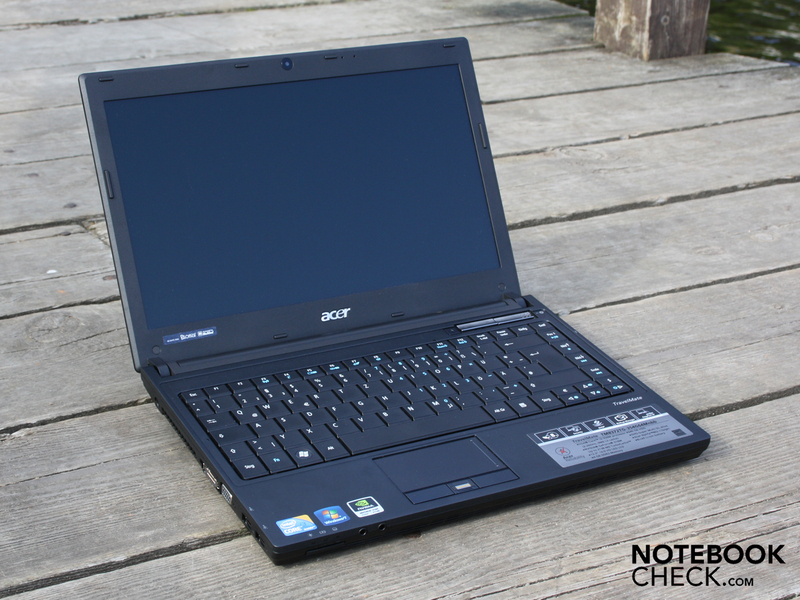 The Acer TravelMate Timeline X 8372TG-354G64N is an ideal candidate. For roughly 850 Euro it has good mainstream performance (Core i3-350M). The matt finished casing is as strong as steel. It works outdoors thanks to a matt display. which gives it a high class finish and additional rigidity. on this rather plain casing (hinges). Connectivity is not its strong point. but it doesn't have HDMI, an ExpressCard34 or a 3G-Modul (internal). Not a lot of extras: No CDs, and one dust cloth. 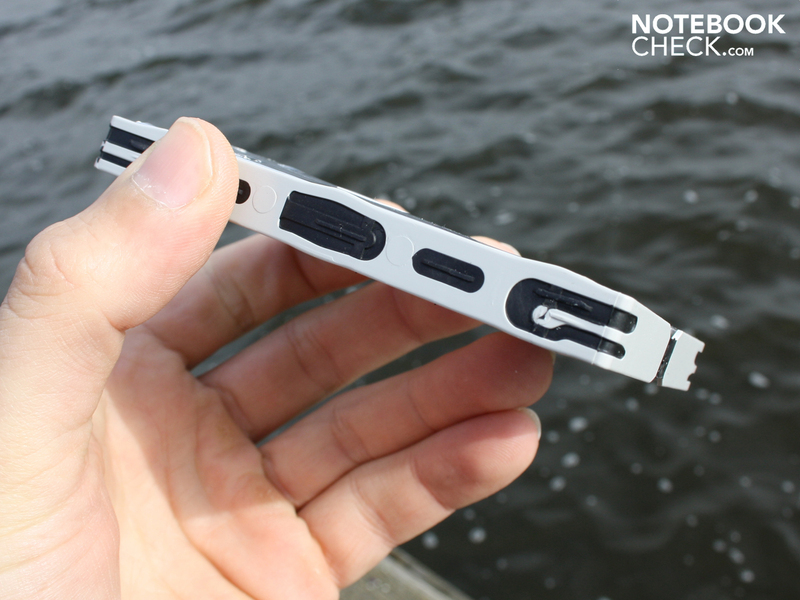 Very good all-round performance in a casing which is usually both quite and cool to the touch. A brighter display and input devices with better feedback. 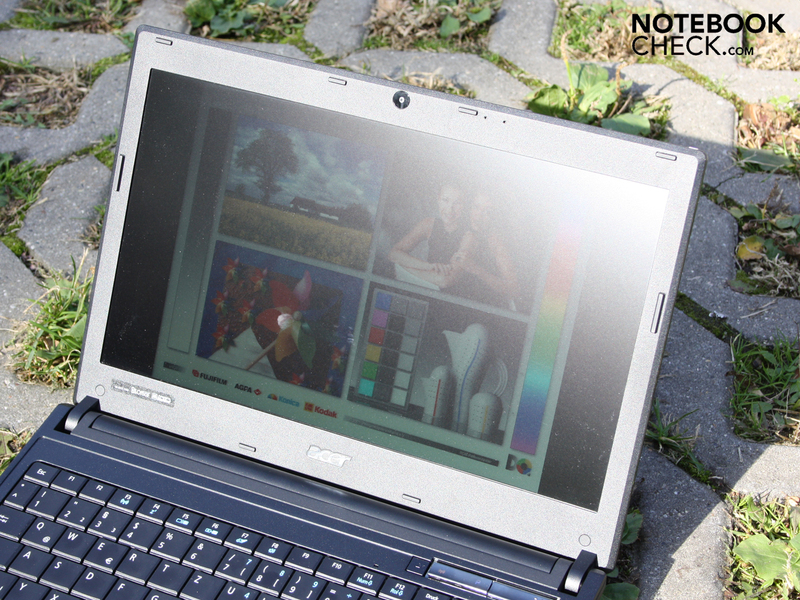 We are used to poor contrast levels, but a laptop with this kind of mobility really needs a brighter screen.